For 125 years, Las Vegas has been home to the state’s only public psychiatric health hospital. In that time, New Mexicans have known it by several names, including the New Mexico Insane Asylum, the Territorial Insane Asylum, or simply, the New Mexico State Hospital. But as society’s view of mental health evolved, so did the institution’s name. 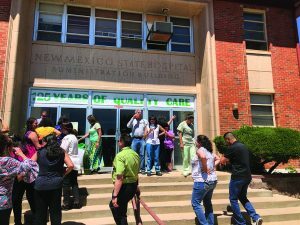 Today, the hospital is known as the New Mexico Behavioral Health Institute. This past May marked the 125th anniversary of NMBHI’s public opening, and today, NMBHI consists of five divisions: the Adult Psychiatric Division, the Forensic Division, the Long Term Care Services Division, the Center for Adolescent Relationship Exploration and its Community Based Services.